I never need an excuse to go to Vancouver, but this is the best one I can think of. The Playhouse International Wine Festival takes place every year in late March, and this was my second—and favorite–visit. I stayed at the hip Opus Hotel, a sweet little gem just off the café-and-club-filled brick side streets of the Yaletown area. So how do “Top 10” wines get chosen? How to Double Gold, Gold, Silver wines rise to the top? Many times, a set of judges (sommeliers, writers, winemongers, etc.) taste a lineup of dozens of wines in flights of five or six wines each. Yesterday, I was at Ray’s Boathouse NW Retrospective, a “single blind” tasting – meaning the judges know what grape the wine is made of, but not the producer. (I also love “double blind” tasting, where you know neither the variety or the producer.) This is an amazing opportunity to taste many wines at once – in this case, 62 whites in about two hours! More and more farmers, fisher and winemakers are getting involved in the Salmon Safe program to help renew and sustain the health of our salmon streams. Check out this fun video from Salmon Safe! I was lucky enough last week to be a prisoner, uh, I mean pupil, of the famous 10th generation glassmaker George Riedel for a two hour tasting demo of his Sommelier Series of glassware. Three glasses—the flat wide Montrachet Chardonnay coupe, the buxom Bourgogne Grand Cru Pinot Noir glass with “acidity spoiler”, and the classic Bordeaux Grand Cru, Cabernet/Merlot glass. There’s always a control sample in these things, so he also included a basic red wine glass from the restaurant we were at, and another “joker”—a plastic cup. All for a reason. First, it was the Chardonnay, the 06 Januik Elerding VIneyard from Washington. “Think of the glass as a place to let the wine to fill a space with its aromas.” In other words, don’t fill your glass too full. We had to smell, first, of course, and note the lovely floral white flowers in the aroma, and banana, but also golden apple. When we taste, it has bright fruit and acidity, “nervous on your palate,” he says. Yes, I get it! Rich, but integrated oak. I was surprised, since these wines do have a tendency to smell pretty oaky. George is an almost sixty (“I’ll be able to ride the train in Austria for half price when I turn sixty!”), and exceptionally well-dressed, and even more exceptionally well-mannered, with the slightest of Austrian accents. Charming, as it were. “We have two types of senses,” he says. “The official—sight and hearing—that can be measured through a benchmark.” You have 20/20 vision, you have a 20% hearing loss in one ear. Measurable. George gets serious. “I am going to complicate your wine life,” he says, and talks about the life of the wine being a combination of many things, a story from the aroma through to the taste and to the finish, “an echo of the wine,” which he finds of ultimate importance. We move on to the Lachini 03 Pinot Noir from Oregon in the big round Bourgogne glass, which supposedly captures the delicate aromas of this “prima donna” of a wine. The little flip-lip at the top helps keep the acidity under control, and the shape of the glass pours it in a little arrow straight to your mid palate, so as not to get too much tannin in the back or sides of your mouth. “The shape of the glass determines the intensity of the aroma,” he says. Again, we move the wine from glass to glass, noting the smooth red berry and earthy minerality in the big glass, the green, almost cabbage-like aromas in the Chardonnay glass, (“You can almost LISTEN to how the grass grows on your tongue!” he says), and in the Bordeaux glass, the pinot is “a disaster!” according to George. I have to say I agree. Someone reaches for a cracker. The crowd, a combination of well-off Bellevue-ites (well, they were two weeks ago, anyway), a few young, hot sommeliers and a few poor writers who expect little and get a free dinner once in a while, are not used to suffering. And we do. We put it into the Chardonnay glass, very similar to most nice red wine glasses we all have in our kitchens. A big round coupe. But George says we need straight sides for these big red wines, to let more of the tannins and acidity out so it mellows them. In this glass, the Cabernet is flat, with gripping tannins and higher acidity. Weird, but true. The crowd laughs. He goes on to explain that a bad wine will taste mediocre in a good glass, but a nice wine will be even better, and who doesn’t want to bring a wine to its full potential? It has been waiting in the bottle all that time for you, after all. As I’m writing this on a Sunday morning, I’m watching the neighborhood’s three-legged cat hobble around a construction site next door. He gives me hope—that even though I’m a procrastinator and often don’t post when I know I want to, that I’m still hobbling around nonetheless! I’m out there searching for mice even though I might not catch them! That said, here is the post I should have posted two weeks ago right after I came back from my trip to Okanagan, B.C., Canada. Here it is! We finally have summer—the days are dry and even what you might call hot. I’m off on my friend Danielle’s annual birthday wine tasting trip—two years ago we went to Willamette Valley, and last year we went to Chelan. 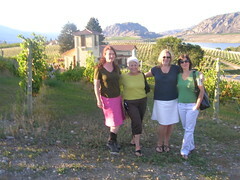 This year, the four of us ladies, of various ages and positions in life, agreed wholeheartedly on B.C.’s Okanagan region, just north of central Washington. I drove out, they flew, and I was the designated rental car. Our first day, we visited three wineries and a goat cheese maker, a full day for five hours. Lunch at Quail’s Gate, then to the famous, fabulous Mission Hill. tried Chardonnay and Ice Wine, but mostly drank in the view and the architecture. This place is known as the most beautiful winery in the area, and I’d have to agree. It’s Mondavi-ized the area, created a destination for people to ooh and ahh over, and then go taste the wines at the smaller, more boutique or mom-n-pop wineries. We also went on a trek to find the Carmelis Goat Cheese Artisan farm and shop, off in the hinterlands of Kelowna’s alpine hills along the shores of Lake Okanagan. They featured over a dozen styles of goat cheese with lovely names like Misty, Blue Velvet and Heavenly—and they were—from fresh yogurt cheese to ash-covered soft-ripened cheese, to smoked cheese to hard, tangy cheeses to a fantastic blue. I bought two Moonlights, a soft-ripened cheese similar to Mt. Townsend Creamery’s amazing Cirrus. Then to Cedar Creek Winery just down the road. The next day, we visited the Naramata Bench, some miles south of Kelowna along the shores of Okanagan Lake. We visited Poplar Grove, Nichol, Kettle Valley (with their crazy Gewurztraminer slushy, great idea but there was nowhere near enough wine in it, just sugar icee with a splash. Then to Elephant Island Fruit Winery, one of the best tastings we had. All their wines are fruit wines, and before you get all snobby on me, you have to realize these wines are their own animal, and each is unique. The pear wine was light, fresh and dry, with a nose of jarlsburg and smoke, to me at least! The perfect thing with a goat cheese salad and an afternoon on a sunny porch. There are also wines from Fuji apples, crabapples, raspberries and their wonderful non-vintage Stellaport made from dark red Stella cherries, fermented and aged in French oak in an 8-year solera system. This wonderful wine had a nose of baking spice and mocha, and dark cherry, of course, with coffee, balsamico and prune on the palate. Would be fantastic with fondue! We had lunch at the gorgeous little Heritage Inn, an old renovated hotel with a good restaurant. At lunch we opened a bottle of Joie’s 2007 A Noble Blend and loved it. Joie’s winemaking couple, Michael Dinn and Heidi Noble, have a small cooking school and winery (not open to the public) just up the road. This wine has a nose of lime zest with a bit of fresh tropical fruit, pineapple, and zesty acidity, great balance. We were so impressed with the wine that Monique called them right from the lunch table and asked if we could come by. Michael said sure! he’d be happy to show us around, so we trotted off to the winery and met he and Heidi and their lovely little farm. We ended up leaving with three half bottles of wine from their afternoon test tasting, and arms full of pears from their little orchard. There’s so much more to say about this trip, but other wines I liked were Le Vieux Pin (we had lots of laughs trying to prounounce that – it’s Le (as in book) Vee-yeuu (as in book) Pa nh (nasally n!) how do you write that phonetically, I don’t know, but the wines were fabulous. Also visited their other new winery, LaStella, which was gorgeous, you MUST go there! More on that later. 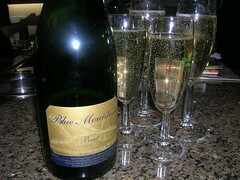 Also Blue Mountain sparkling wine and pinot blanc and pinot gris. And Nk’Mip (INK-a-meep) which was big and resorty and disappointing as far as wine goes, but looked like a great place for family vacations. On a recent trip to the Tri-Cities wine region (Richland, Kennewick, Pasco for you non-Washingtonians) I had a chance to visit four vastly different wineries. One was one of the oldest wineries in the state—Powers (and Badger Mountain, their organic brand) on the hills above a Richland suburb, literally—we had to drive through suburban neighborhood to get to the tasting room and vineyard. I took a short truck ride with owner Bill Powers (now in his 80s) up to see the Chardonnay vines and have a sip of the Powers 2007 Chardonnay – a clean, crisp organic wine, full of fresh green apple and citrus flavors. Powers has been growing grapes here since 1977, and has been organic almost that long. He says he was putting all these chemicals on the vines, and his boys were doing the work. He didn’t want the kids to do it, so he was doing it and not liking having to use these chemicals – so on a trip to California, he talked to some hippie grapegrowers who were farming organically, and they encouraged him to do the same, and so he did. And still, he’s one of the few certified-organic vineyards in the state. He does, as other organic farmers do as well, use sulphur to combat powdery mildew on the vines, about once a week for a certain period during the vine’s growth – this year was very humid and perfect for the evil fungus to grow. And then of course, sulfites are added to the wine to preserve it – pretty much every winery does this, or we’d be opening a lot of bad bottles. But Powers (Bill and his son Greg, the winemaker for Powers & Badger Mountain) and Mickey Dunne, part owner of Badger Mountain, have found a solution for their “no sulfites added” organic wine – bag in the box! It keeps oxygen away from the wine, and therefore keeps it completely fresh for up to 30 days! This is so common in Europe that I’ve heard box wine is almost 50 percent of the market. Here, it is growing, but still only about 10-12 percent. I hope that will increase as people put higher quality wines in completely recyclable boxes.